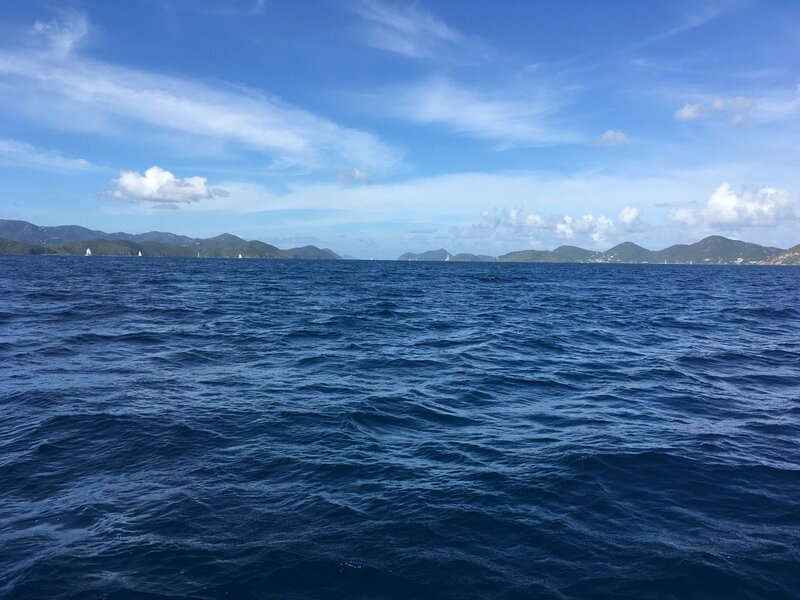 Sir Francis Drake Channel in the British Virgin Islands. The full moon’s shimmer on the water and the lights of Tortola and Road Town across the Sir Francis Drake Channel are in full view as I sit on the stern of our boat anchored in Great Harbor. Those lights, symbolize a dream. Freedom, courage, adventure. We began the dream a couple of years ago. To be able to sail in the Caribbean Sea, on our own, together, in love. To see the deep, turquoise water and to be under power by only the wind is an awesome feeling. Adventure of a lifetime. Patrick Conway, on his evaluation of big cruise ships coming to Tortola. He was our Airbnb host on the West End. 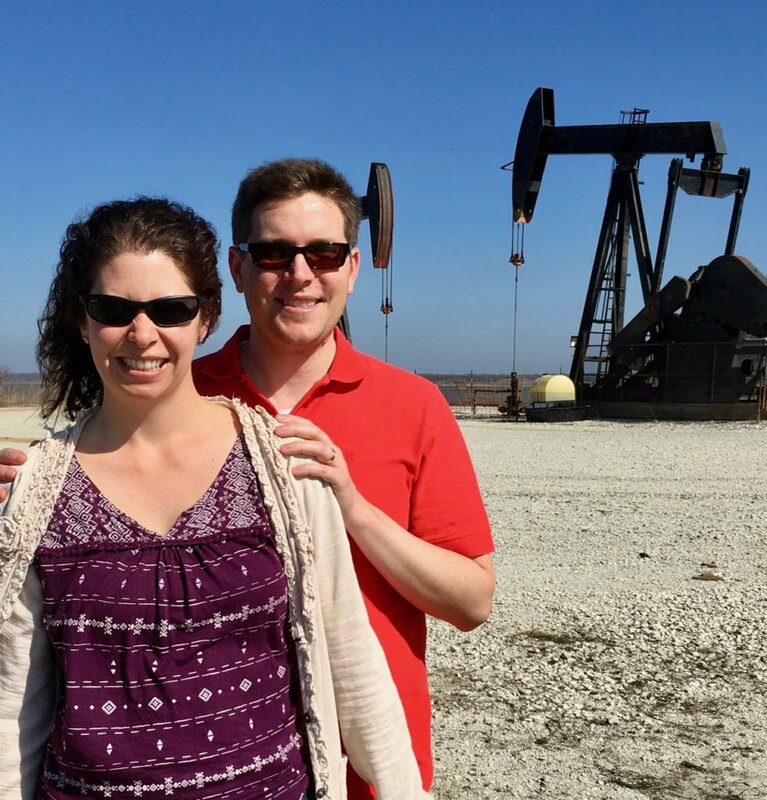 2/11: Hagerman National Wildlife Refuge (NWR), Texas: Of Pelicans, pterodactyls, and petroleum. Colossal oil rig contraptions – they remind me of Pterodactyls – giant, winged, reptiles that roamed the Earth millions of years ago. This reptile became extinct with all the other dinosaurs in the late Cretaceous Period some 70 million years ago which formed the massive crude oil deposits we now extract. Hagerman NWR is home to much wildlife and the oil rigs that churn up the crude oil made from the decomposed dinosaurs. Breathing in the irony of the moment – these oil rig Pterodactyls will become extinct in my daughter’s lifetime; hopefully extinguishing the carbon dioxide emissions from burning all this Cretaceous crude. On one of the islands, we broke out a picnic of sandwiches, veggies and sauvignon blanc. My daughter and son-in-law, Heather and Shane, on Hagerman NWR with the pterodactyl oil rigs. The oil rigs churning, a breeze, wide open expanses of wetlands and water…overhead a flock of big white birds with huge heads descended slowly without any motion, floating down onto a small spit of land three hundred yards in the distance…White Pelicans, they sort of look like Pterodactyls. Jeanne Hoffman after an Augusta County Board of Supervisor’s meeting where banning fracked gas and backyard chickens were on the public hearings agenda. stream pollution. It doesn’t matter if that pollution comes from a wastewater treatment plant, a malfunctioning septic field, or the back end of a cow. It made me appreciate, once again, how lucky I am to be here and to be with Jeanne, the most remarkable woman I have ever known; hard-working, intelligent, caring, and so beautiful. Her leadership and love for the animals make the farm successful and such a joy to be in. I don’t consider our work here on the farm as “work”. It is our life, and I feel so lucky to be, in it. There are things that just amaze me every day like the birth of a calf in cold weather, seeing a clutch of Killdeer scuttling from us as we drive the truck through the pasture with hay or just looking at Jeanne in her farm clothes and pearl earrings. Jeanne calling the cows; now that’s very special. I so enjoy her calling the cows, every single day. And I enjoy seeing Val’s tail fluffed up when he is excited. Val is our two-year-old Border Collie. His tail looks like a white pom-pom on top of his body. My dad saying, “I love you too, son”. 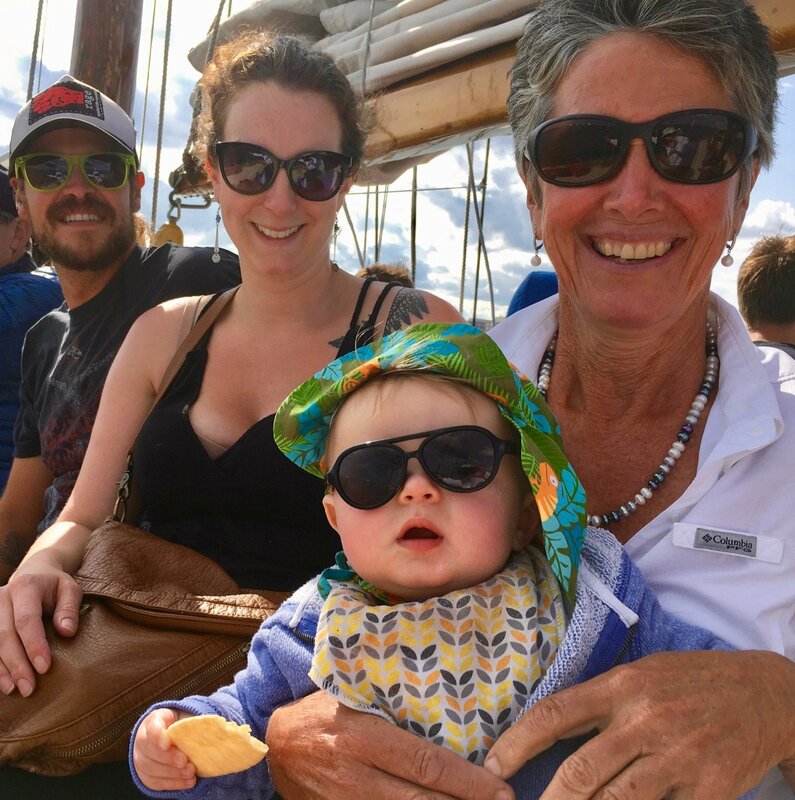 Neal, Kate, Conley, and Jeanne sailing in Casco Bay, Maine. 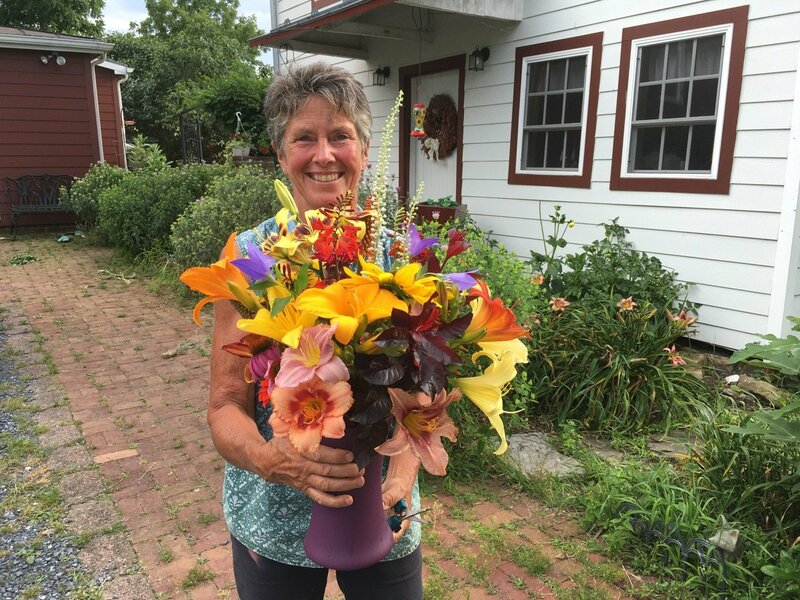 Jeanne picked all these flowers from the gardens of Meadowview and will give to a friend. 3/5: Good morning. One of the stream exclusion jobs I have been working on for years…yes, years…will come to fruition, I hope soon. Reflecting on what has taken so long…first, the bureaucracy of FSA, NRCS and Congress’ failure to pass a farm bill on time. Second, parental, old-school advice and the fear of failure, and lastly, that inhibition, or lack of confidence, that keeps us from taking that final step through the door of opportunity. My client’s first call to start the process of fencing her neighbor’s cattle out of her streams and wetlands was to the CBF Richmond office. Libby Norris dispatched me to investigate. I’ve been shepherding this project ever since. My point in this communication is that many of our successes take a long time and we should never forget that service, staying in touch, and building a relationship with customers is very important. 3/19: Green grass emerges from its brown, dormant cloak of winter. Northern Harriers glide and teeter, close to the ground in search of anything that moves. In the vast grasslands of Swoope, Virginia, the headwaters of the Shenandoah River it’s voles they hunt. American Plum pushes forth its white blooms, and the metallic-blue, white-bellied, male Tree Swallows arrive to guard nesting sites for their lifetime mates. This is March, the beginning of calving season on our beef cattle farm. 4/24: On average, a mature cow weights half a ton. Think about a herd of fifty, half-ton cows with hooves like big ice cream scoops climbing up and down a stream bank. The soil ripped out by their hooves gets in the stream and suffocates the critters that live in it. If there are cows in the stream, the water is going to be brown – like chocolate milk, because of all the dislodged soil suspended in the water. 6/16: June is when we harvest carbon – the carbon sequestered by the grasses we cut for hay. It’s amazing – a cow digesting grass. 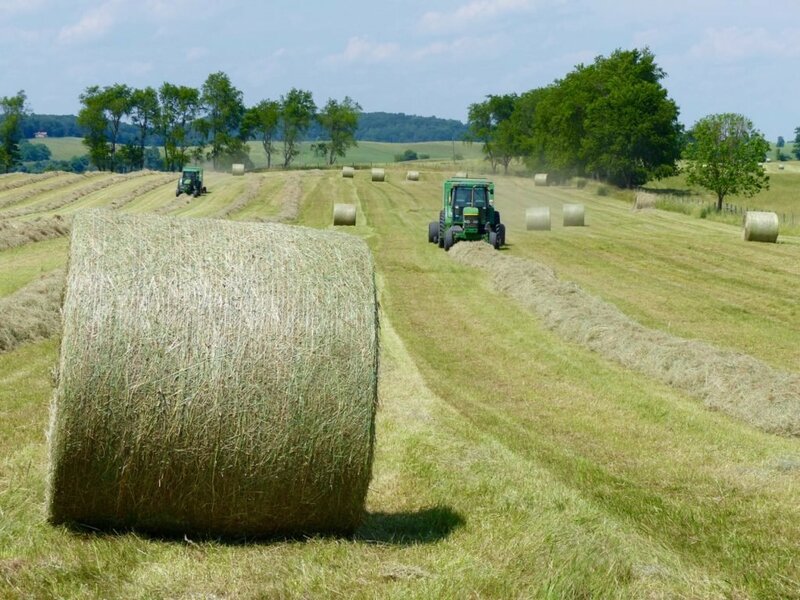 We cut the grasses in our hay fields, let it dry then bale it into half-ton round bales that we’ll feed this winter when the pastures are dormant. I love the smell of hay. For some odd reason, I love putting it up. It’s a wonderful feeling; knowing you have food for the cows for the entire winter. I like to think of making hay as baling sunshine. After all, sunlight and green plants make it possible for us to make hay and for all humanity to live. 8/16: Dominion’s Atlantic Coast Pipeline (ACP), if allowed to be built, will be the largest disturbance of land and water in the Commonwealth of Virginia since the Interstate highways were built. Is it possible or even probable that Dominion can dig up a 600-mile-long, ten-foot-deep, 125-foot-wide swath through three states, crossing hundreds of streams and meet each state’s water quality standards? I do not believe it is possible nor probable. 10/18: But there are now torpedoes of ignorance, greed, and science denial in the water – launched by the Trump administration, and aimed at the fundamental environmental laws that have gotten us so far. I gnash my teeth. They want to “water down” the definition of “Waters of the United States” so that polluters can get away with it and thereby increase their profit margins. They want to zero out funding for the Chesapeake Bay Program and for clean water initiatives everywhere and seek to discredit scientists and hide or destroy their research. I say damn the torpedoes, full speed ahead. We – and every last one of us – need to tell our representatives in Washington that clean water is vital to our future as a country, and they must continue to fully fund clean water initiatives. There’s another thing that money can’t buy – trust. When the Virginia Outdoor Foundation accepted Dominion’s $4M to build their pipeline through 11 “eased” farms, they sold their soul and our trust. They betrayed the trust of every landowner that donated their development rights to them since 1968 and all future donors. Those people gave them over 800,000 acres of development rights to defend. Dominion Energy wants to build a 42-inch high pressure fracked gas pipeline through West Virginia, Virginia and North Carolina. Their current, planned route goes through 11 “eased” farms in Virginia. On Monday (16th of October) the VOF granted Dominion Energy their “swap” of three parcels of land and blood money for the right to dig through these 11 farms. Say no to the “swap” and get nothing in return or, take the “swap” and get the money. They forgot about the value of trust. The trust every easement donor had and the trust that can never be regained for the future of open-space protection. Kim Coble, Chesapeake Bay Foundation Vice President for Environmental Protection and Restoration, in a statement about Congressman Goodlatte’s amendment to gut EPA authority, 9/8/17. Guard tower on the citadel fortress of El Morro, Old San Juan, Puerto Rico. 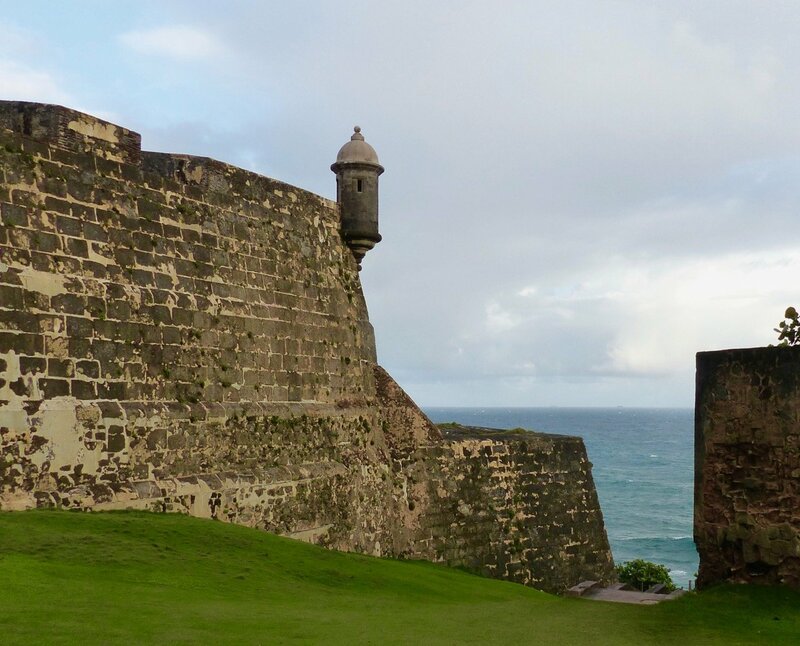 11/27: Construction of the citadel of El Morro, in Old San Juan, Puerto Rico began in 1539. It guards the entrance to the first fresh water supply in the Western Hemisphere for ships traveling from the East. It’s a UNESCO World Heritage Site. Jeanne and I walked the halls and roads of this fortress of protection in December of 2016. Hurricanes Irma and Maria in September of October of 2017 devastated the Island but not this fortress which has endured for over four and a half centuries. The people of Puerto Rico stand as strong as this fortress despite the lack of support from the Trump administration. Our President, throwing paper towels at a crowd of people without water to drink was an embarrassing publicity stunt. My first Native American name, bestowed upon me by the Princess of Swoope on 3/7/2017. Bobby and Jeanne: I LOVE your “Native American” name! I wish many of us Americans had such an apt sobriquet. Imagine how our society might find time to observe, think, and empathize with the plight of the planet. I also loved your comparison of pelicans to pterodactyls. I’ve often thought of kingfishers that way, especially with their reptilian rattle vocalizations along our streams and rivers. I look forward to your next rumination from the Kingdom of Swoope! Very touching, very well written, and a very healthy and positive view of life in the face of some very troubling times for resource conservation. What a nice start to my day, reading your thoughtful journal entries. The pictures of your lovely wife and family interwoven are striking to me. After all, it is for our own families and the families of others that we want to preserve the wonder of the natural world around us. Its restorative powers are essential to the rejuvenation of our souls. So it was when El Morro was built, so it is when BIG ENERGY wants to cut deep swaths through our mountains and forests, rather than using all that construction cost to invest in development of renewables. Spot on Ginny. Thanks for your comment. I see why Jim thought so much of you. Thank you for sharing. We all miss Jim very much. Thank you, Arlene. Kingdom of Swoope? Looks like a Queendom from here. Thanks for sharing these Bobby. Love reading it – and always appreciate thinking of the good people out in the field and remembering those who’ve done great work and who’ve gone before us – like Libby. Thanks for stopping in Kristen and for your comment. Thank you, Bobby, for sharing your Celebration of Life, Earth’s Lands, Waters, your life with Jeanne on Meadowview, your Gratitude and Reverence for Creation …and for your Leadership in what matters most in so many matters and ways. Don, thanks so much for your kind words and vote of confidence. I’ll have to run your modification by the Princess. Best to you and hope you are well in Maine. One extinction will lead to another. Ours will probably be quicker.